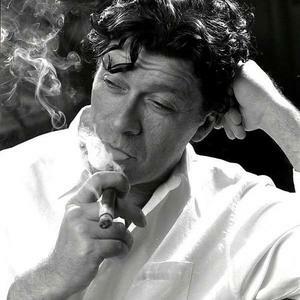 Jaime Robbie Robertson (born July 5, 1943 in Toronto, Ontario, Canada) is a songwriter, guitarist and singer, probably best known for his membership in The Band. Early life Born to a Jewish father and a Mohawk mother, (he took his stepfather's last name after his mother remarried), Robertson's earliest exposure to music was at Six Nations 40, Ontario, where he spent summers with his mother's family. He studied guitar from his youth and was writing songs and performing from his teen years. By 1958, Robertson was performing in various groups around Toronto. In 1960, he met singer Ronnie Hawkins, who headed up a band called The Hawks (after relocating to Canada), and joined the group, which toured often, before splitting from Hawkins in 1963. The quintet styled themselves as The Canadian Esquires and Levon and the Hawks,(after rejecting such tongue-in-cheek names as The Honkies and The Crackers), before ultimately calling themselves The Band. Bob Dylan hired The Band for his famed, controversial tours of 1965 and 1966, his first wide exposure as an electrified rock and roll performer rather than his earlier acoustic folk sound. Robertson's distinctive guitar sound was an important part of the music; Dylan famously praised him as "the only mathematical guitar genius I've ever run into who doesn't offend my intestinal nervousness with his rearguard sound." From their first album, Music From Big Pink (1968), The Band was praised as one of rock music's preeminent groups. Rolling Stone magazine praised The Band and gave its music extensive coverage. Robertson sang only a few songs with The Band, but was the group's primary songwriter, and was often seen as the de facto bandleader. In 1976, Robertson decided to break up The Band, reporting that he was exhausted by nearly twenty years touring. In the Martin Scorsese film The Last Waltz (1978) he noted that he had been playing live rock and roll music almost since rock and roll began. Also, as the band's chief song-writer, he was able to live off the song royalties, and no longer needed to tour. The Band reformed in 1983 without Robertson. From 1987 onwards, Robertson released a series of four solo albums that began with a self-titled album. In 1990, he contributed to Japanese musician Ryuichi Sakamoto's album Beauty. At the 2003 commencement ceremonies at Queen's University in Kingston, Ontario, Robertson delivered an address to the graduating class and was awarded an honorary degree by the university. In 2006, he announced plans to write his autobiography. Martin Scorsese hired Robertson to compose the musical score for his 1980 film Raging Bull. Robertson would later work on Scorsese's movies The King of Comedy, The Color of Money and Casino, and act as executive music director for Gangs of New York.